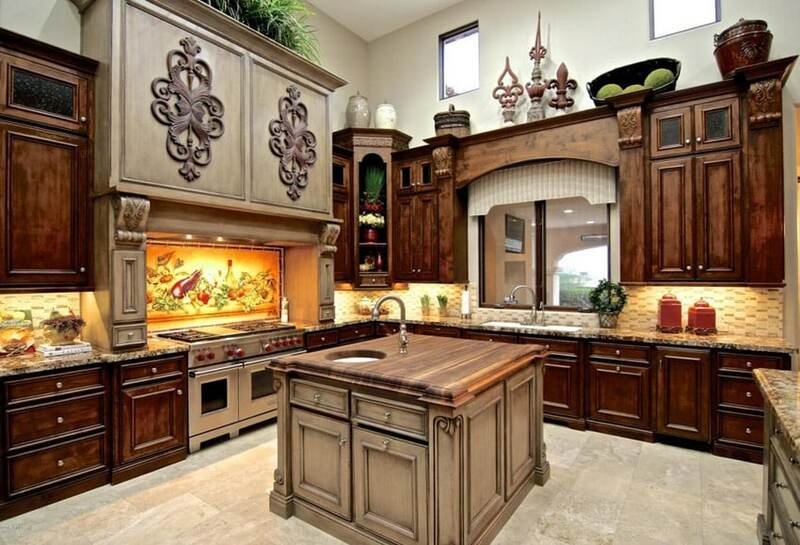 This is our picture gallery of beautiful kitchen designs with islands. A kitchen island can be a useful way to maximize your home’s cooking space. 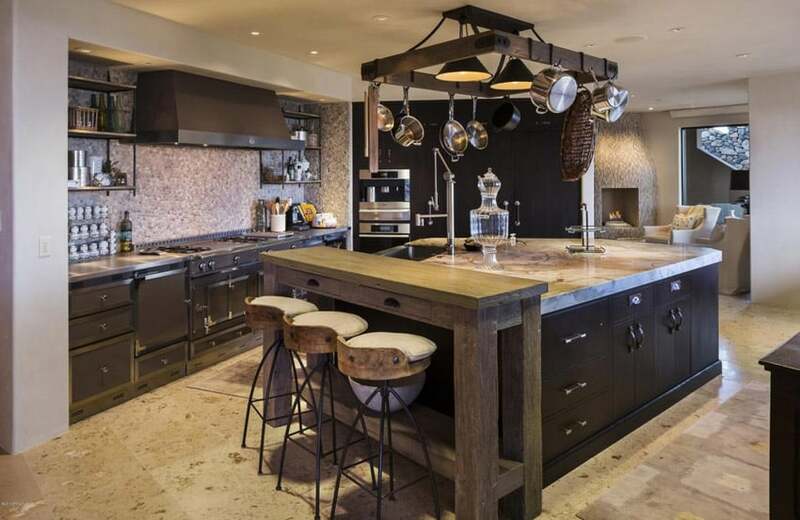 These designs feature luxury kitchens with custom islands in a variety of styles and finishes. We hope these kitchens give you plenty of ideas for inspiration for your own home. A large traditional style kitchen which uses unique gunmetal-painted kitchen cabinets. 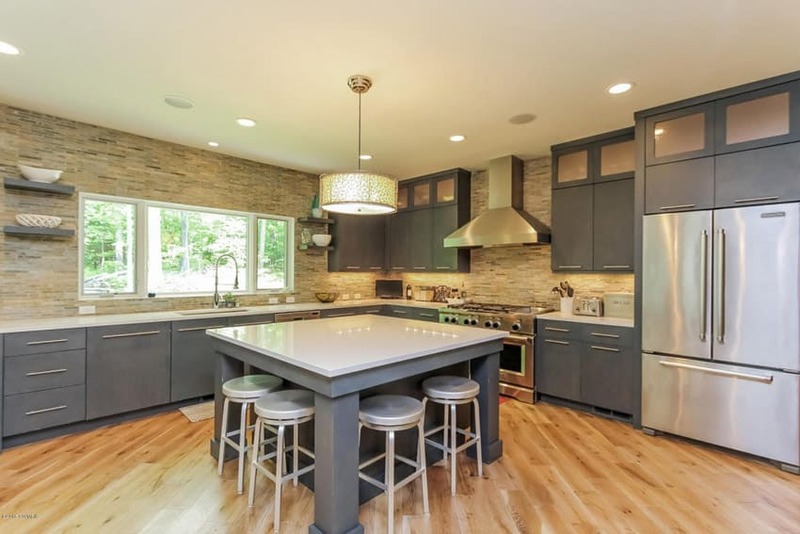 It has a large rectangular kitchen island in the same gunmetal grey color with paneling details and is topped with white granite counter top. 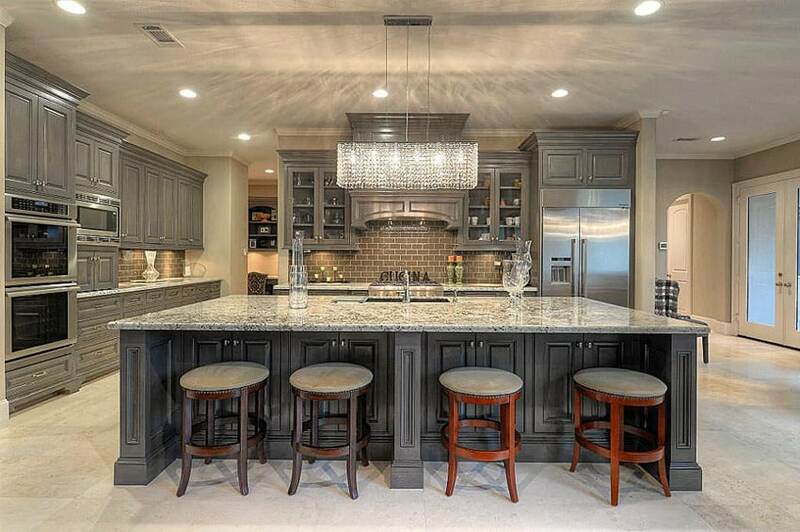 The kitchen island is further emphasized from the rest of the kitchen by placing a modern crystal chandelier right above it, which also adds a more dramatic lighting effect to the space. A traditional kitchen with breakfast bar island, plain white paneled cabinet base and wood-framed glass doors for the overhead cabinets. The beige cream granite counter top and the ceramic tiles on the backsplash adds a subtle contrast to the white cabinets. 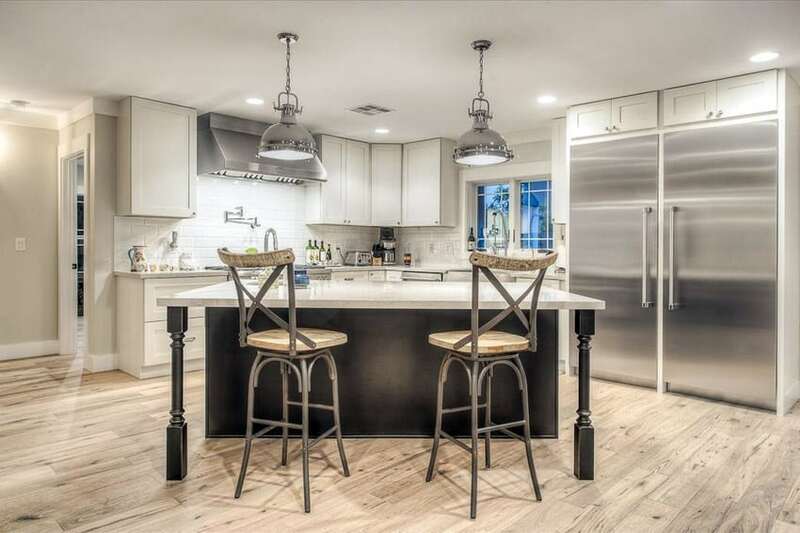 Additionally, it has a rectangular kitchen island white white base cabinets connected to a built-up base painted in gray which helps supports the ledge for the bar counter. A gorgeous kitchen space which combines modern aesthetics with the beauty of traditional style kitchen cabinets. You can see that the floors, walls and ceiling are very light – white ash ceramic floor tiles, white walls and ceiling. The main kitchen cabinets are simplified paneled cabinets in light gray with white marble countertop and marble subway tiles for backsplash. At the center is a rectangular kitchen island in Oak finish and topped with plain white solid surface, with integrated storage, sink and dining area. The high ceiling of this traditional luxury kitchen design makes it look airy and spacious, plus there is sufficient natural light going inside the space, illuminating it well. 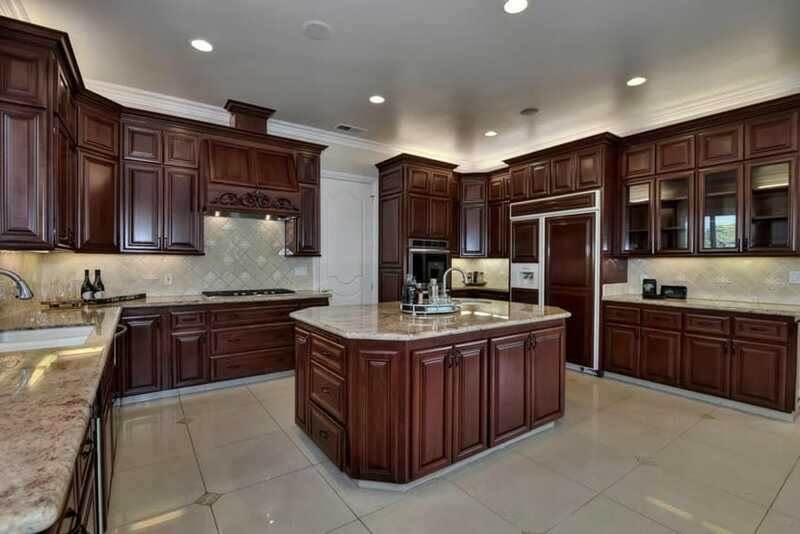 The main kitchen cabinets are paneled solid wood in dark walnut stain finish and topped with beige granite. 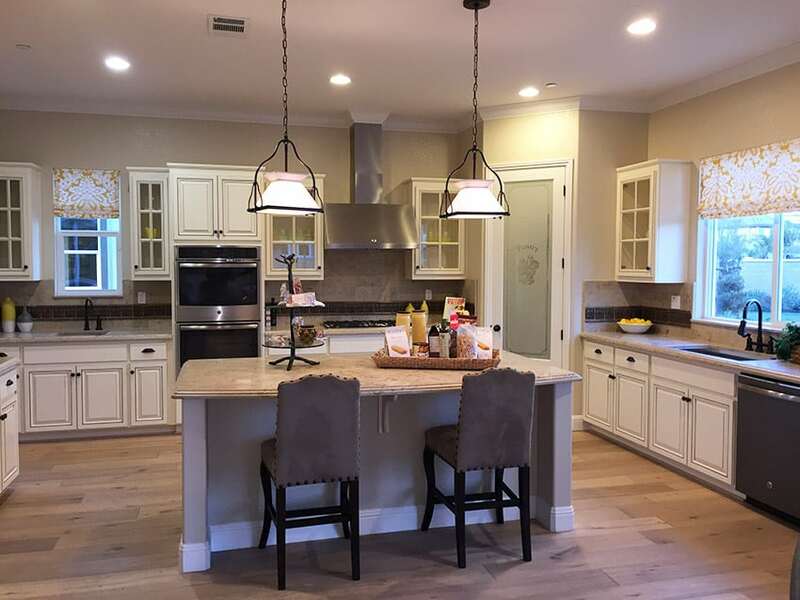 It has a small square kitchen island with solid wood butcher’s block counter top, paired with light beige painted base cabinets which contrasts with the dark stained wood of the main cabinets. 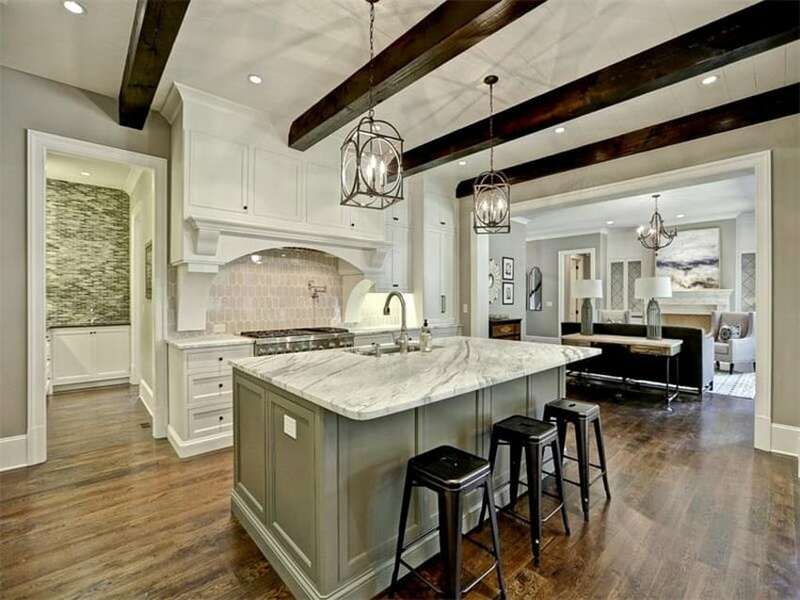 This is an open concept kitchen with a very unique kitchen island placement. 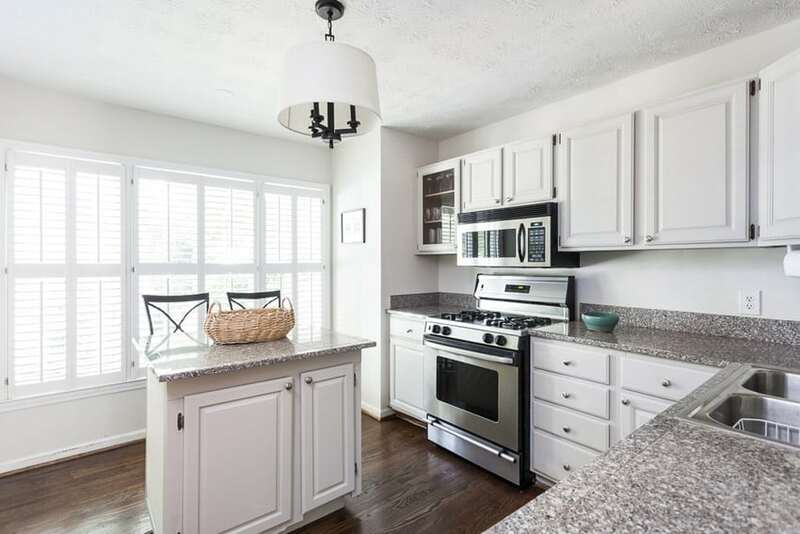 While the main kitchen cabinets were kept basic – white cabinets, white subway tiles for backsplash and white granite counter top, the rectangular kitchen island was placed diagonally and not perpendicular or parallel to any of the main kitchen cabinets. The unique placements makes the layout more dynamic and interesting. Additionally, the black-painted base of the kitchen island stands out from the pale colored space, and is even topped with two industrial-style pendant lamps. A very relaxed and refreshing country-style kitchen, with large full-height windows creating a bright and cozy atmosphere in the kitchen. 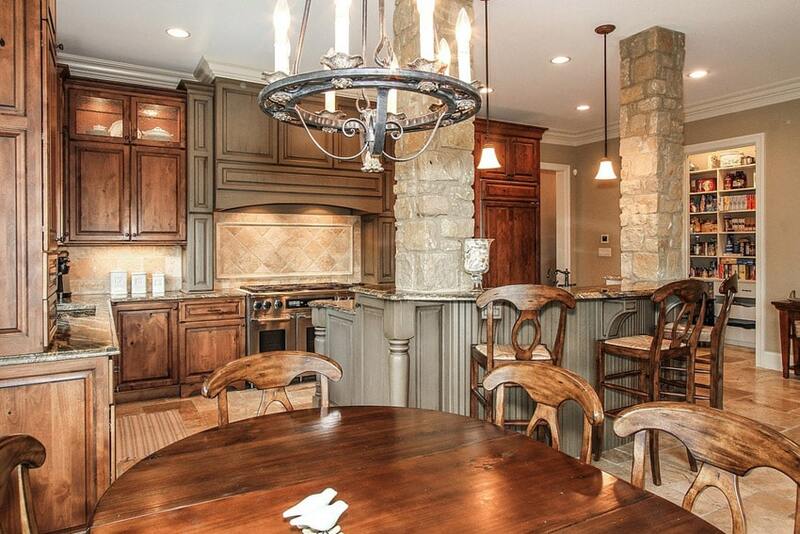 A dining area is also place right across the kitchen, allowing you to entertain your guests while you prepare food. The kitchen cabinets are all uniform – paneled solid wood painted in a light mint green color, giving a cool and relaxing appeal to the kitchen. The rectangular kitchen island topped with Carrara marble separates the kitchen from the dining area and also provides space for dining. 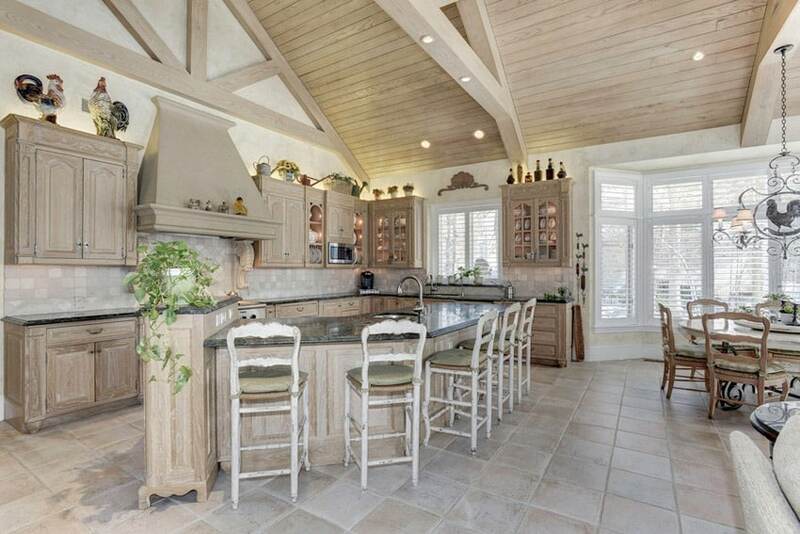 With an open floor plan style of layout, this kitchen looks really large and spacious. 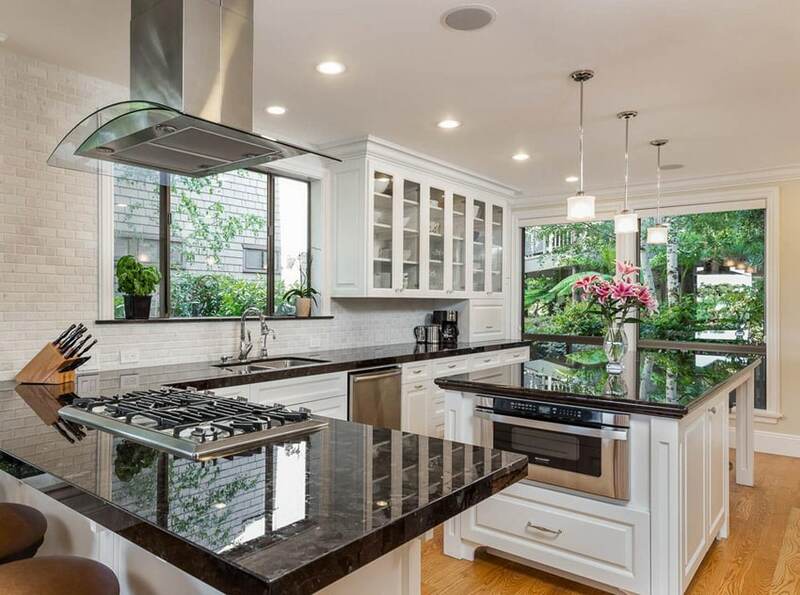 It has only one wall for the main kitchen counters with white cabinets and topped with black granite, but it does have a very large kitchen island with wengue laminated base, marble counter top and a dining ledge able to accommodate 4 or more diners at a time. The large kitchen island not only provides additional storage, it also functions as additional preparation area, divides/separates the kitchen from the rest of the house and also serves as an informal dining area. This decorative wood kitchen island has a built-in sink and is topped with a thick beige color granite and offers under counter storage and eat-in dining. This kitchen itself has honey color wood cabinetry with a rustic style. The open concept design has an efficient work triangle and the layout is great for entertaining friends and family. A well-illuminated quaint kitchen, with lovely light gray walls which helps the off-white kitchen cabinets pop-out. It has a small rectangular kitchen island made of solid vertical planks of wood in mahogany finish and topped with white granite. This kitchen island serves as additional preparation area for the small kitchen, as well as a small bar counter for dining. The mismatched bar stools adds an industrial and casual feel to the space which also matches the look of the pendant lamps placed right above it. A modern kitchen space which uses traditional style kitchen cabinets to add a touch of personality into the space. The walls have a white-painted brick finish, giving it a rough finish and adding pattern to the surface. This is paired with simple white paneled kitchen cabinets, with glass doors for the overhead cabinets and topped with black galaxy granite. There a rectangular kitchen island in the middle which houses a convection oven, as well as additional storage and dining area. A traditional kitchen which gives off that classic cozy and warm atmosphere. 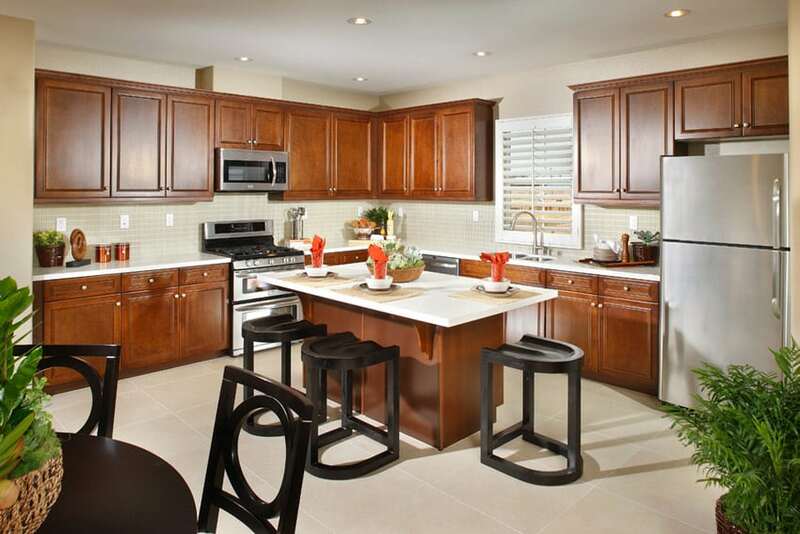 The solid chestnut wood kitchen cabinets gives a natural elegant appeal to the space. This is paired with gray salt & pepper (Perla) granite counters and textured ceramic tile floors which adds texture to the space. 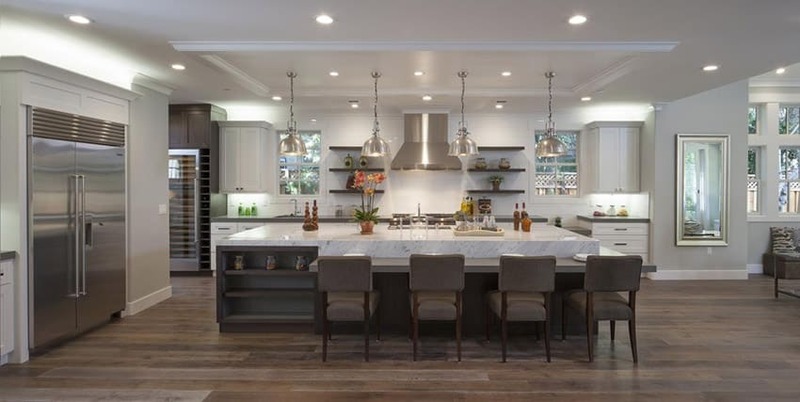 It has a large rectangular kitchen island with a curved ledge for the bar counter surface and has three Tiffany pendant lamps, adding a romantic touch to the space. This traditional kitchens bright and cozy with a full room dedicated for the kitchen and storage area. 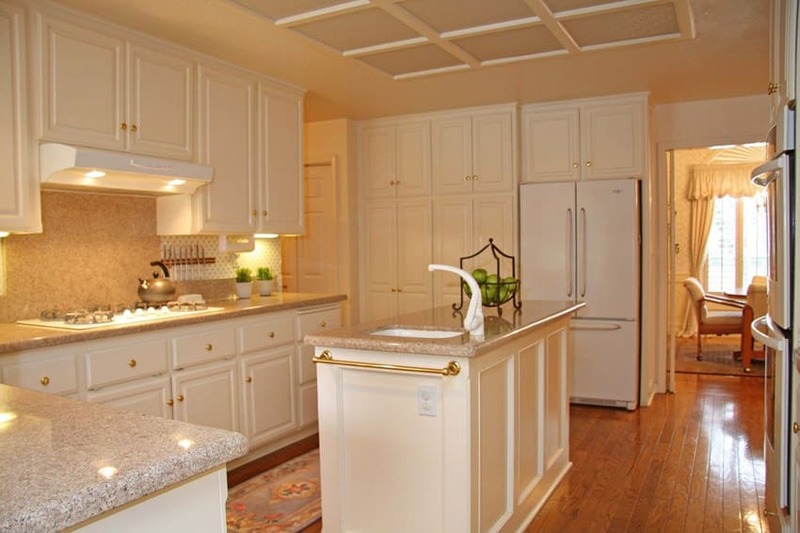 The main cabinets are white in traditional style paneled doors with brown granite counter top. 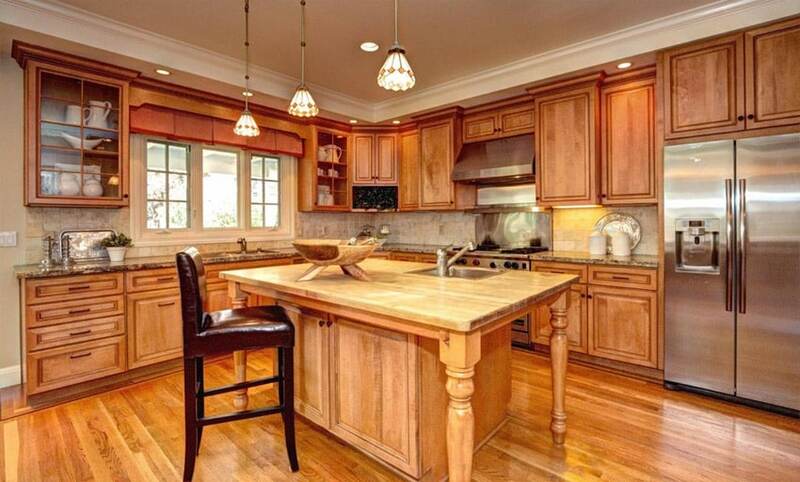 At the center is a very large kitchen island with solid Mahogany stained base. This is used for additional dining area, storage, and also has an integrated sink. 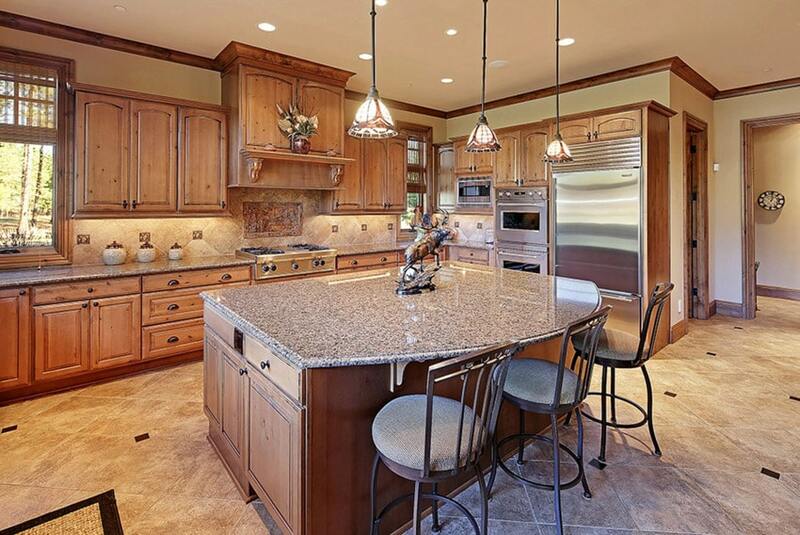 Another traditional kitchen design with a golden glow mostly due to its choice of colors and finishes. AS you can see, the walls and ceiling are painted in a light beige color, and the kitchen also has a large iron chandelier with warm white lights illuminating the space. Additionally, the main kitchen cabinets are in solid Antique Teak paired with orange toned granite counter top with matching brass finish faucets. For the kitchen island, the base cabinets were instead painted white, making it stand out from the heavy wooden main kitchen cabinets. 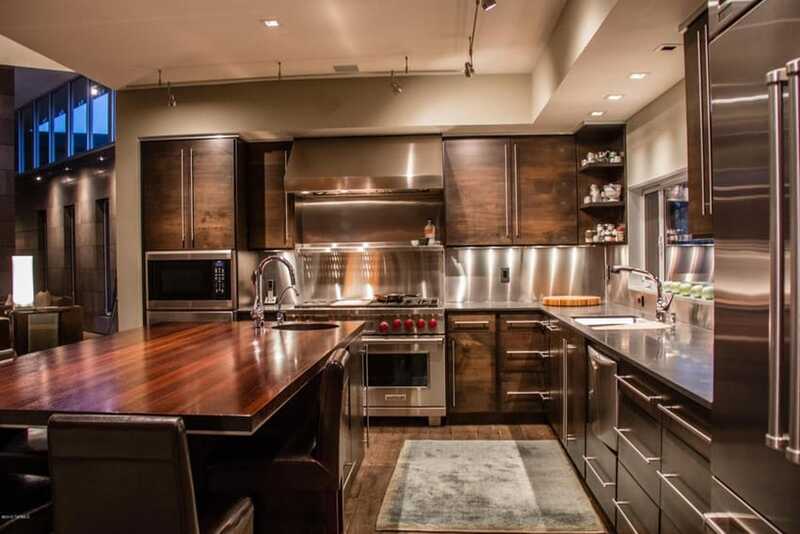 A very gorgeous modern kitchen with a rustic industrial appeal. It uses wengue laminated base cabinets topped with stainless steel counter top. The the back splash finish is a bit unique, using pebbles instead for tiles or glass. It has a very large irregularly-shaped kitchen island in the same finish as the main kitchen counters, but is instead topped with white soapstone. Hanging above the kitchen island is a rustic iron-framed pans rack which perfectly matches the bar counter which uses weathered solid wood and industrial style bar stools with black iron legs. This open plan kitchen is placed across the living area, giving it spacious feel despite the smaller size. The whole house has Natural Hickory wood floors with gray-painted walls. 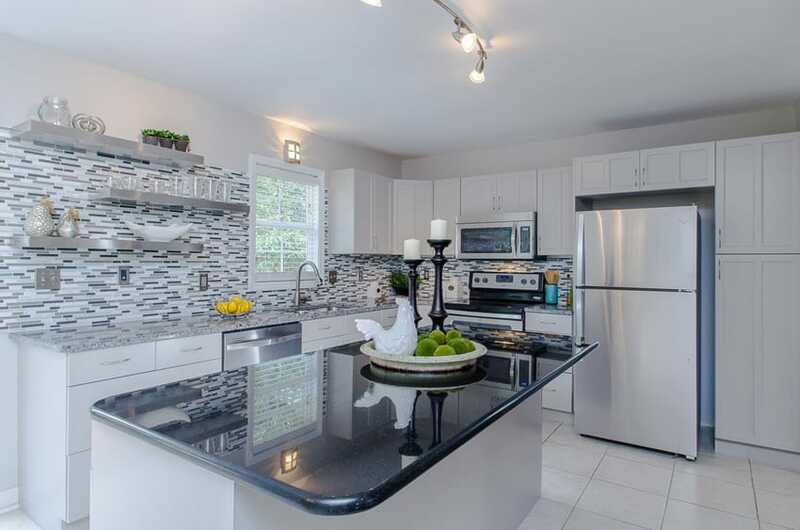 The kitchen cabinets are painted in white with marble counter top and a unique hexagonal backsplash tiles in gray. 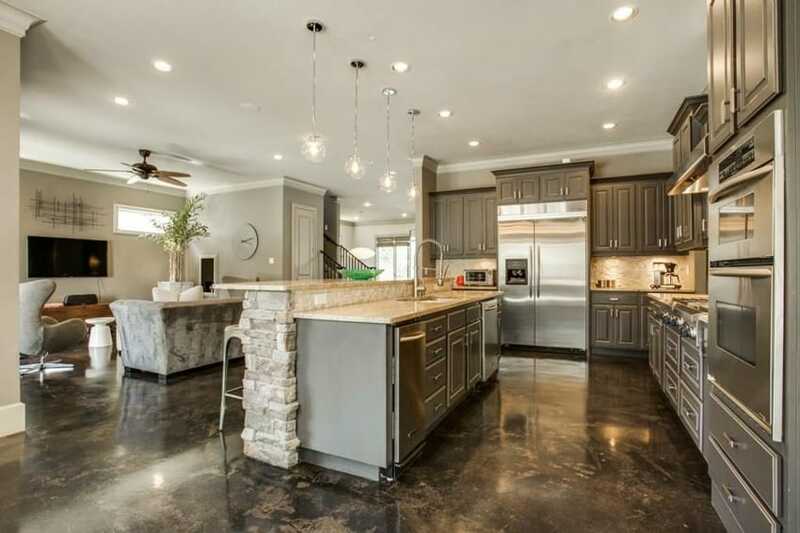 There’s a rectangular kitchen island a the center with warm gray painted base cabinets and marble counter top. The marble extends a bit to form a ledge to serve as a bar counter, allowing space for 3 bar stools for dining purposes. 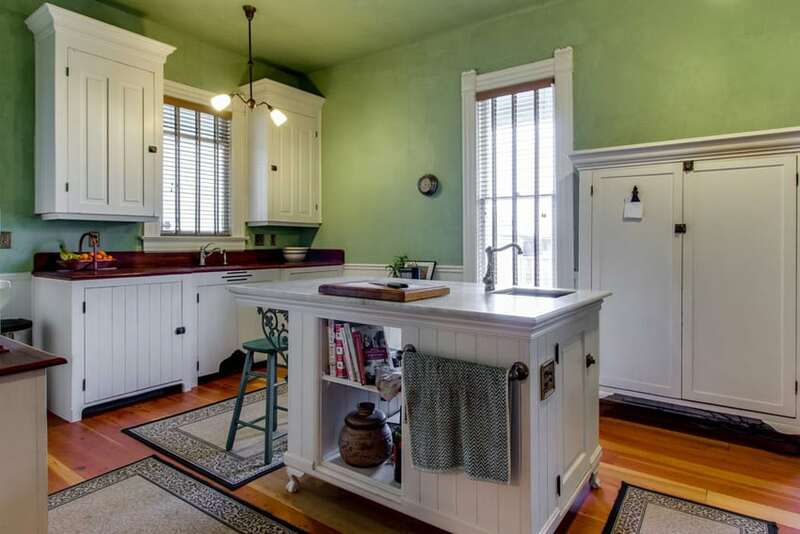 This quaint rustic style kitchen, has unique sage green walls and ceiling combined with solid Oak floors. 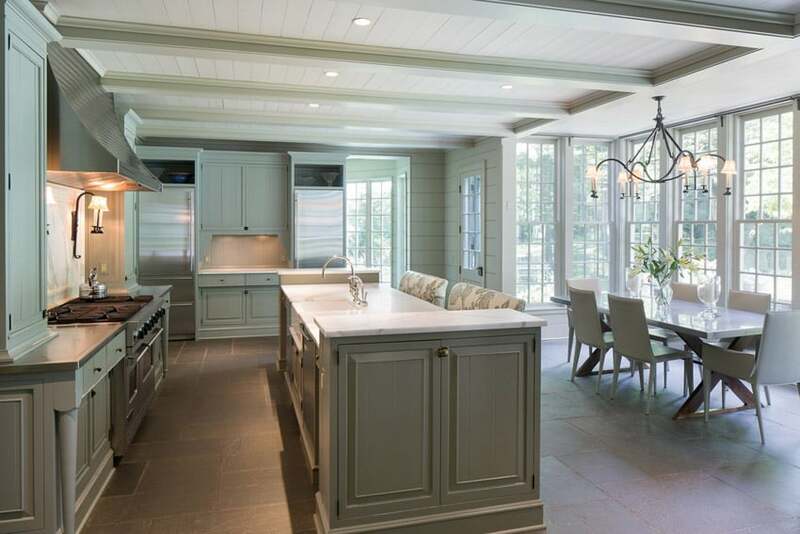 Because of the bold color of the walls and ceiling, the kitchen cabinets were kept white, with vertical beadboard wood slats, adding pattern and texture. 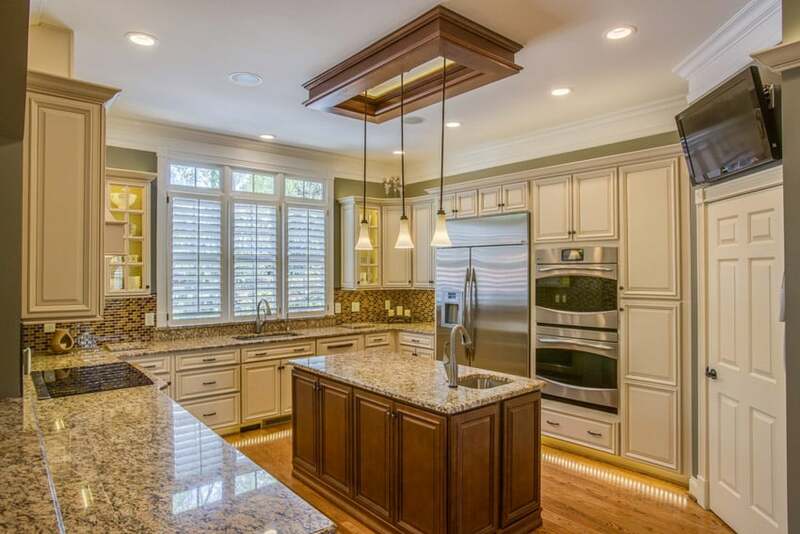 The counter top of the main cabinets are red granite, while the small kitchen island in the center uses a more elegant-looking marble counter top. Using modern modular cabinets, this space is able to use a pleasing combination of white and wood tones, creating a balanced feel to the kitchen space. As you can see, the base cabinets are laminated in colonial maple wood finish, giving it a soft and subtle wood tone, while the overhead cabinets uses plain white high gloss laminated giving that modern appeal. For the counter top, white solid surface was used, and the same was used on the rectangular kitchen island where the cooking hob was placed. Bright windows, light gray walls, a plastered ceiling and dark walnut floors give this kitchen a nice background which has a balance of dark and bright colors. Similarly, the kitchen cabinets used balances light and dark colors as well. It uses white painted cabinets, combined with dark gray salt & pepper granite counter top, adding a visual texture to the space. The small kitchen also fits a small square kitchen island which serves as additional storage, work top and of course, a dining area which is able to accommodate two bar stools. Despite the modern appeal of this kitchen, it is able to give that rustic feel to it with its choice of wood finishes. While the walls are painted in a neutral light gray color, the solid wood floors give a rustic appeal as it uses rustic oak wood floors. The kitchen cabinets are simply laminated in white, with black solid surface counter top and a unique backsplash panel with abstract textures in white. 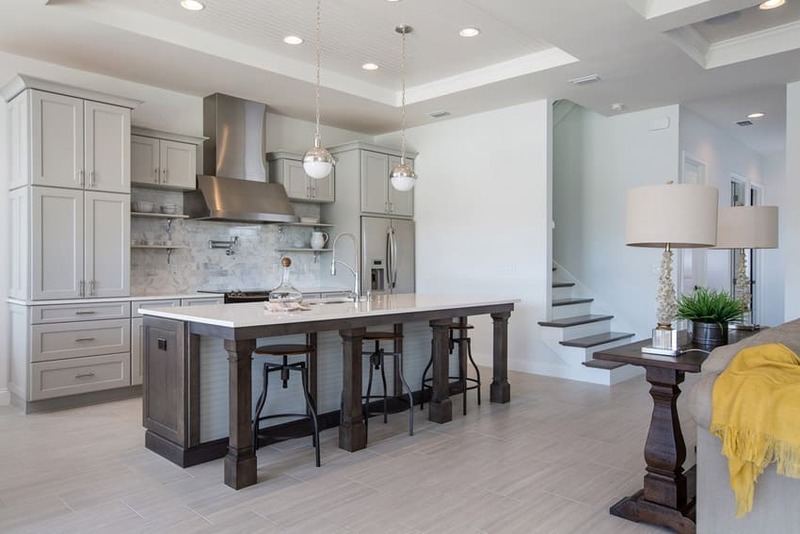 It has a very long kitchen island with white quartz counter top and sides, while the face of the bar counter uses horizontal planks of reclaimed wood veneer in silver oak. The gray color of the kitchen island base adds to the rustic appeal of the space and adds a nice contrast against the white quartz counters. A full sized kitchen maximizing the available space by occupying most walls with kitchen cabinets and storage. Despite the small space, this kitchen is well-illuminated, with white walls and pearwood floors, giving it a nice subtle warmth. The kitchen cabinet style are simplified paneled doors in dark gray finish, topped with white solid surface and paired with white subway backsplash tiles, giving it a more modern look. In the middle of the kitchen is a small kitchen island with the same base cabinets and quartz countertop, used mostly for additional storage and as additional preparation area, creating a smoother work flow in the kitchen. Kitchen designs with islands are often used for spaces with larger layouts. 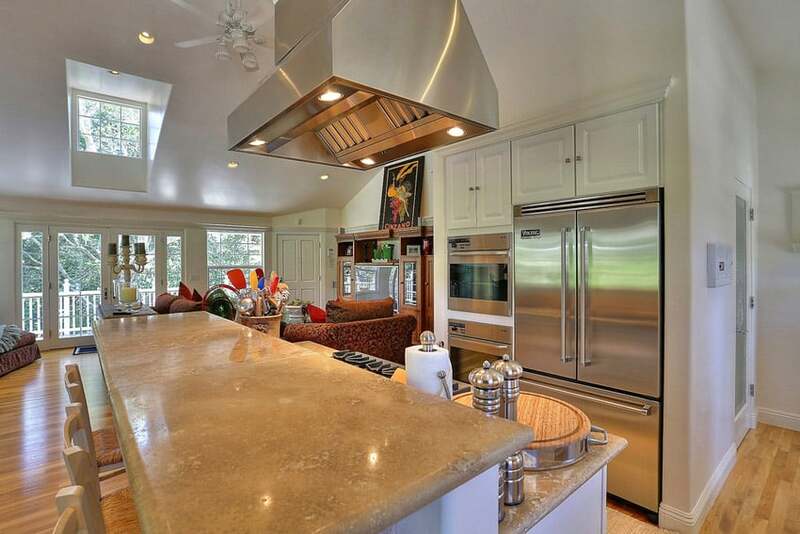 The small size of this kitchen did not deter the use of an island with breakfast bar seating. Darker wood tones are used for its base kitchen cabinets, as the space is very well illuminated and has nice light gray walls as background. 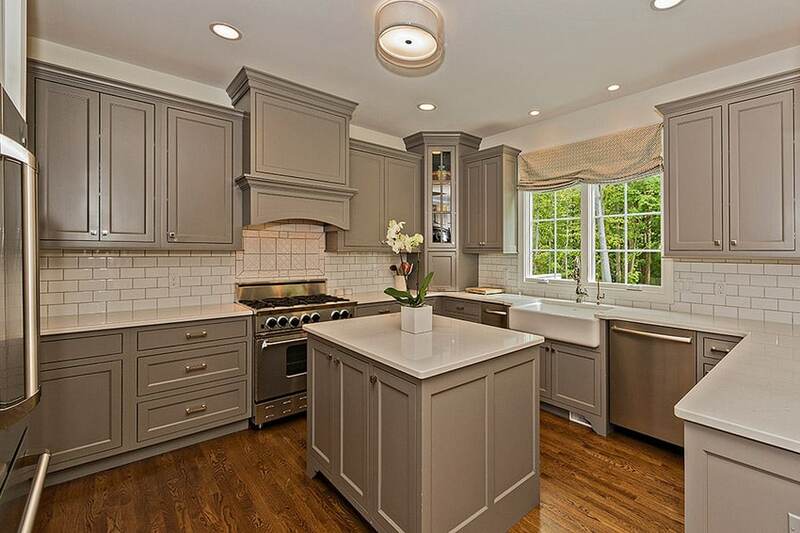 The kitchen cabinets are solid mahogany topped with gray salt & pepper (Snowfall) granite. 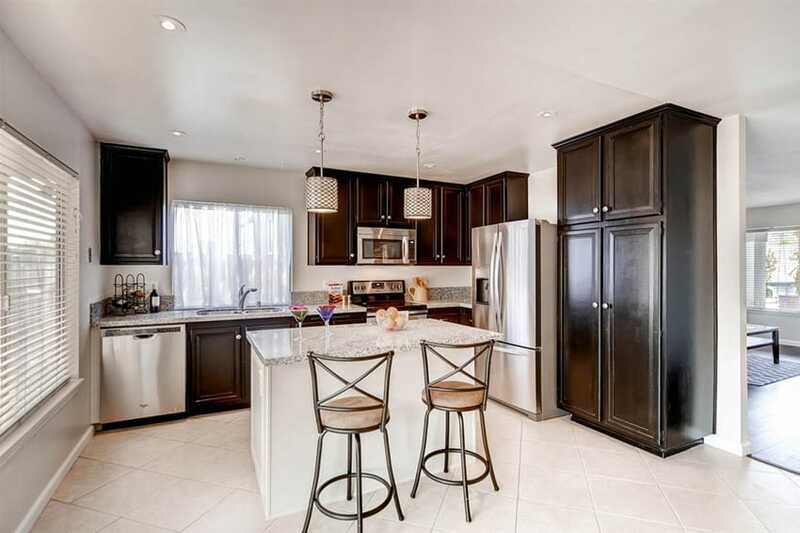 It has a small kitchen island with white base cabinets but has the same salt & pepper granite counter top. The ebony laminated panels of the kitchen cabinets gives a nice star contrast against the white walls of the kitchen. This is topped with white solid surface and paired with white subway tiles for the backsplash. 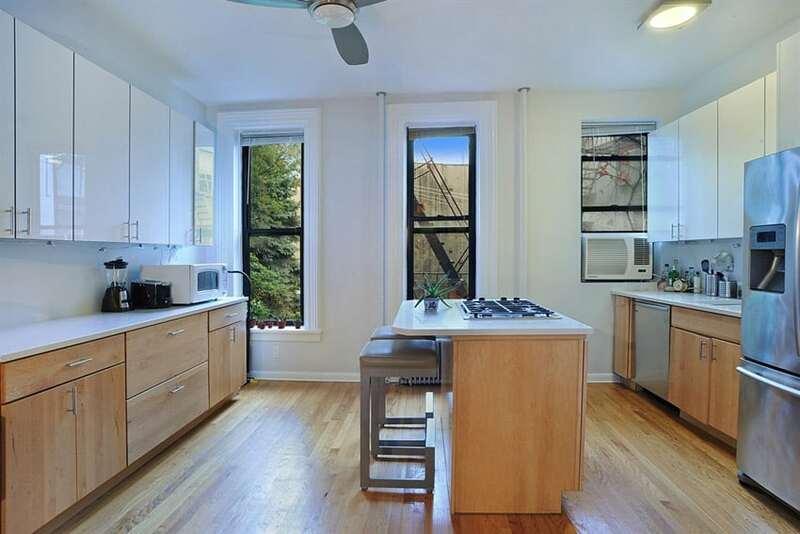 To give the space a more open feeling, there is no overhead cabinet, but just open overhead shelves. In the middle is a large kitchen island with the same ebony laminated base cabinet and white solid surface counters. This kitchen really looks bright as it goes for the pure white color scheme and places it against dark walnut flooring. As you can see, the whole kitchen space is fully utilized for both storage and work area, using white-painted kitchen cabinets topped with white marble and white subway backsplash tiles. The kitchen island also uses the same materials and finishes as the main cabinets, and allows up to 3 users to sit & dine together. Situated at the center of the house, this kitchen is pocket-sized, having a very limited space in this open plan home. Despite its small size, the open plan helps it look big and bright, but the size also means that space should be utilized effectively, that is why the main kitchen cabinets are full storage walls, with built in ovens and cabinets to maximize the wall space. The kitchen island separating the kitchen from the rest of the house holds the cooking hob and the sink, as well as provides additional dining area to the house. The island has a poured beige concrete countertop that contrasts well with the white cabinetry. A clean white modern kitchen white plain white walls and pale maple flooring, this space looks big and bright, especially due to its high gabled ceiling. This is even more enhanced due to the fact that the kitchen cabinets are also in all white. On the gray solid surfaces countertop adds a bit of contrast, as well as the iron base of the bar stools. I has a rectangular kitchen island at the center, white white base and white solid surface counters, decorated by flowers and blown glass pendant lamps. Kitchens designs with islands that have two types of countertops can evoke interest and drama. While most kitchens goes for a warmer look, this kitchen uses cooler color tones for its palette. As you can see, all kitchen cabinets are simply white, topped with salt & pepper granite counter top, but the use of blue pearl granite for the kitchen island and the glass mosaic tiles on the backsplash with grays and blues gives a cooler over-all tone to the kitchen space. 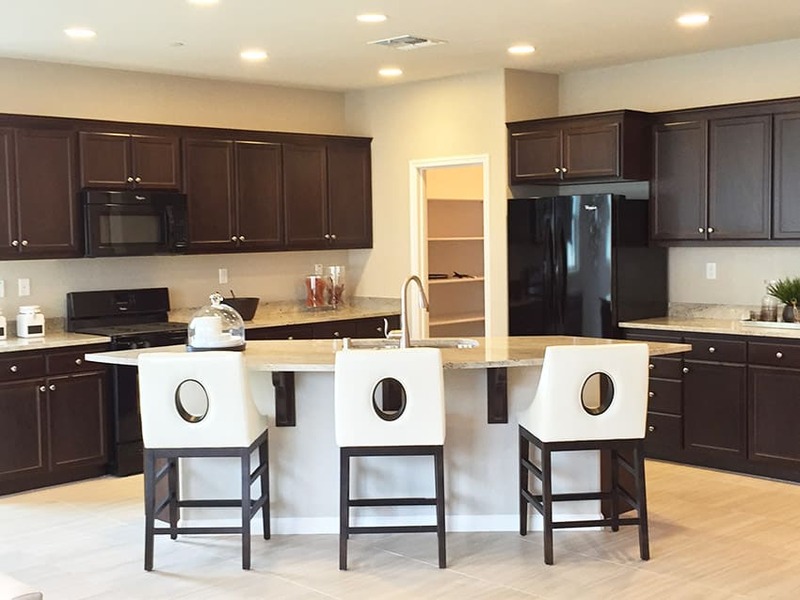 This large modern kitchen uses uniform style kitchen cabinets. 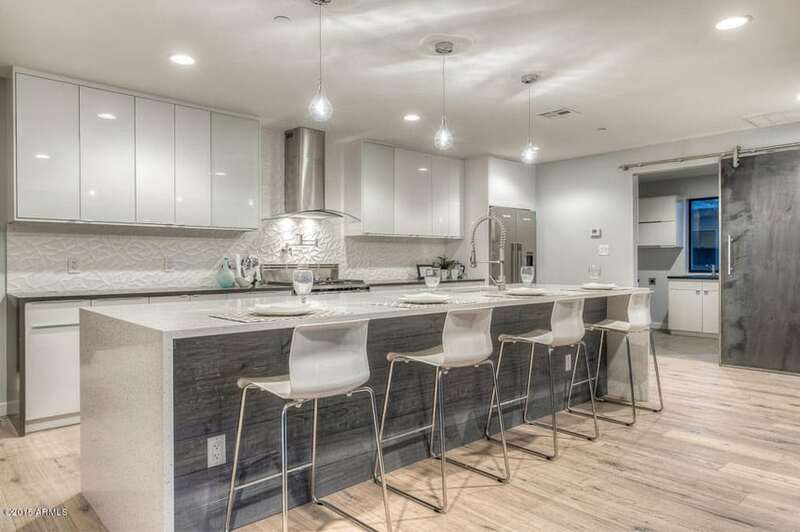 All were laminated in a slate gray color with a rough industrial-style texture which complements the perfectly smooth and seamless surface of the white solid surface quartz countertop used. This kitchen also has a large square kitchen island which is mostly used as preparation area and a bar counter for dining, able to sit 4 people at once. Kitchen designs with islands aren’t commonplace in many apartments. 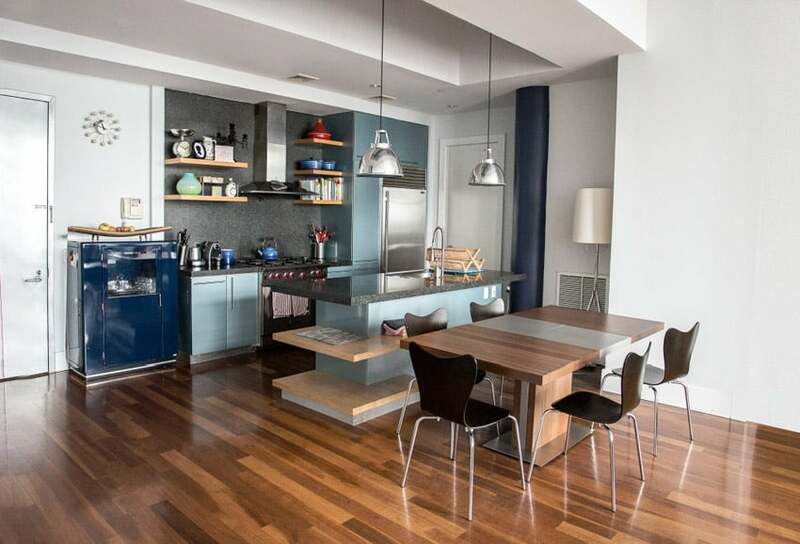 This is an open layout kitchen in an apartment building that has an island with cushioned stools for seating. The kitchen cabinets are traditional in style, painted in a refreshing green color, giving a fun pop of color to the space without being too bold. It has a small rectangular counter which also doubles as a bar counter or dining area topped with a very elegant Carrara marble. This kitchen space has a dark masculine appeal as it foes for a gray and white color scheme. The floors of the whole space is black with brown texture and combined with light gray walls. 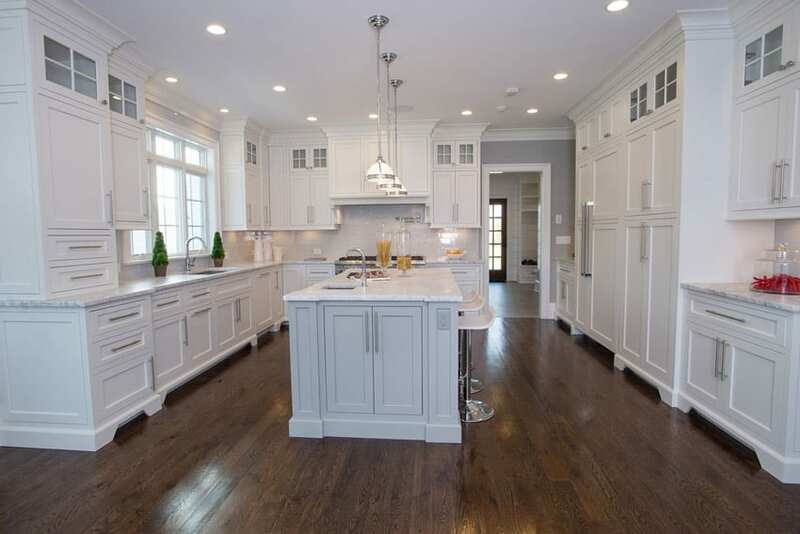 For the kitchen cabinets, traditional paneled style doors were used and has a dark gray paint finish. There’s a rectangular kitchen island with built-in sink and dishwasher placed against a built-up bar counter with sandstone cladding and beige (Fantasy Ivory) granite counter top. Right above the bar counter/ledge are 4 blown glass pendant lamps, completing the masculine appeal of the space. This modern kitchen is a bit more adventurous with its combination of colors and finishes. The kitchen cabinets are laminated in a metallic blue color, and is paired with black quartz counter top and backsplash which goes up to the ceiling of the kitchen. There is no overhead cabinet, but there are maple wooden ledges for additional overhead storage. The same colors were used on the modern kitchen island – metallic blue base cabinets with black quarts counter, and lower open shelves laminated in light maple wood. Accentuating the kitchen island are two industrial style stainless steel pendant lamps. This eclectic kitchen space looks clean, crisp and simple, with its white painted walls and cabinets and high ceiling. 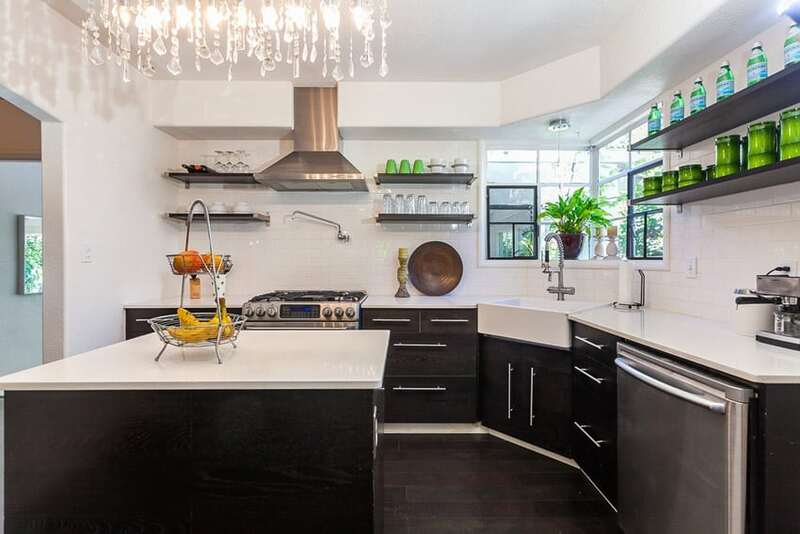 The main kitchen cabinets uses black solid surface and has white vertical wood planks for its backsplash. The kitchen island used is quite unique. Instead of using fixed base cabinets with stone counter top, the kitchen island here is a rustic movable table counter with an open base and weathered paint finish. This adds more personality to the space, as well as adds a nice pop of color to the otherwise plain kitchen. 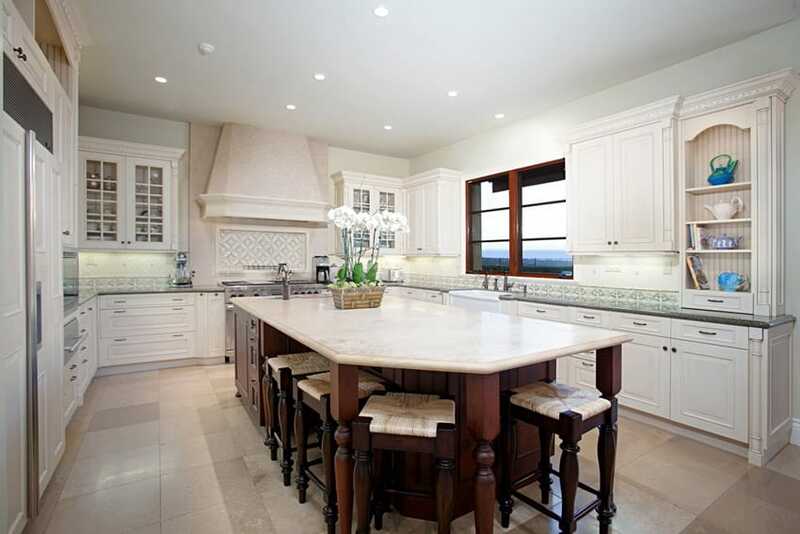 A full-sized kitchen featuring all white paneled kitchen cabinets wit white marble counter top. This was paired with white glass subway tiles for the backsplash and stainless steel hardware and faucets. 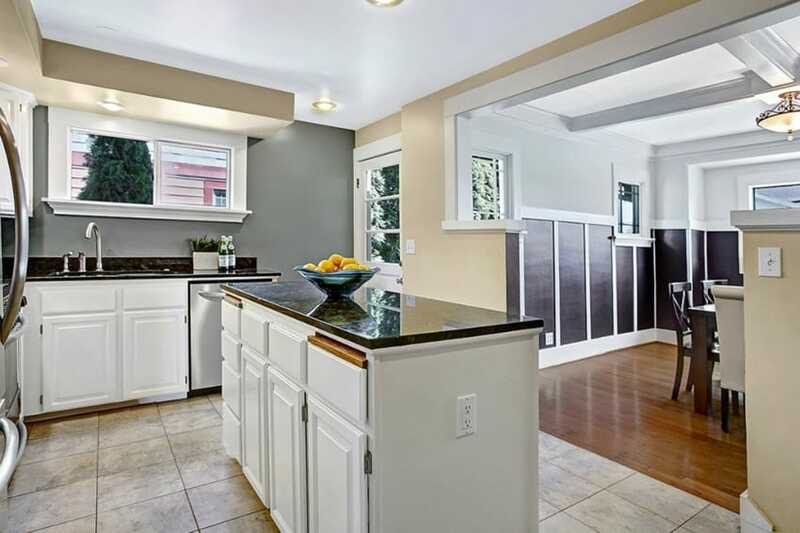 The white cabinets comes out nicely against the light gray walls and the solid cherry wood floors. Since the space is quite narrow, the kitchen island is narrow as well, with the same white base cabinets and an extended countertop to serve as a ledge/bar counter area. This is a full-sized kitchen with sage green walls and light oak wood floors. The main kitchen cabinets used are painted in cream and topped with salt & pepper granite. This is paired with glass mosaic backsplash tiles which adds more browns and greens, as well as pattern and texture to the space. At the center, is a small kitchen island with oak base and salt & pepper granite countertop, with a small under mount sink. As this kitchen fully takes up most of the wall space for kitchen cabinets and pantry storage, it is only able to fit a small rectangular kitchen island with a small sink in the middle. The kitchen cabinets are traditional paneled cabinet door painted in a very light cream color and paired with light beige color Andino White granite counters, giving this kitchen a soft warm glow. The walls of this small kitchen is painted in a gray color and this is paired with some portions of the wall and the dropped ceiling painted in a yellow cream color. Because of the dark background surface, the kitchen cabinets used are in white and topped with Black Pearl granite. Despite the small space, the planning is efficient. It even has a small kitchen island which provides additional storage, as well as two pull-out cutting boards. The slate blue walls gives a refreshing vibe to the space without being to bold. This color also complements the white kitchen cabinets well. Due to the limited space, the kitchen has an open layout, with an L-shaped kitchen island to separate it from the rest of the house. The kitchen island has a higher bar counter with two black-stained bar stool which matches the dining set used. 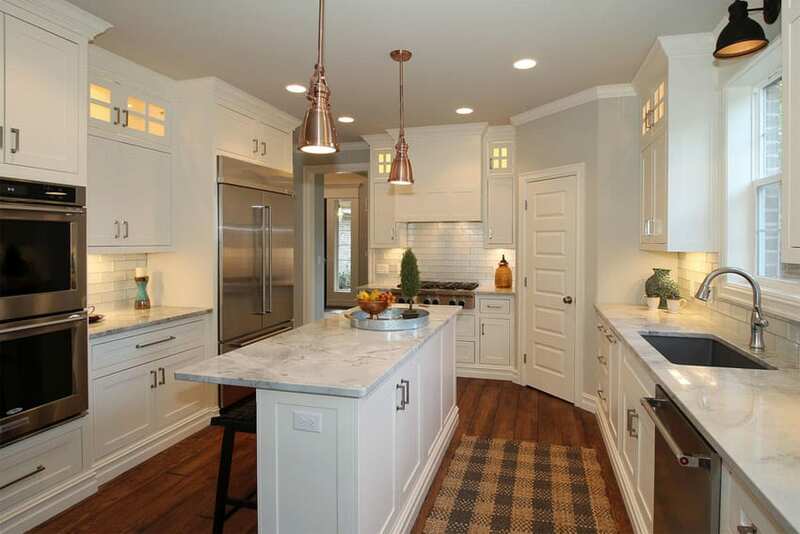 A very large traditional style kitchen which uses pale warm colors, giving a nostalgic feel to the space. The whole place looks large as it has a very high gabled ceiling with natural maple wood slats and solid wood beams. The kitchen cabinets are in rustic oak as well in a rough matte finish, giving it that antique and weather appeal matching the rest of the space. This is stopped with smooth green granite counters. 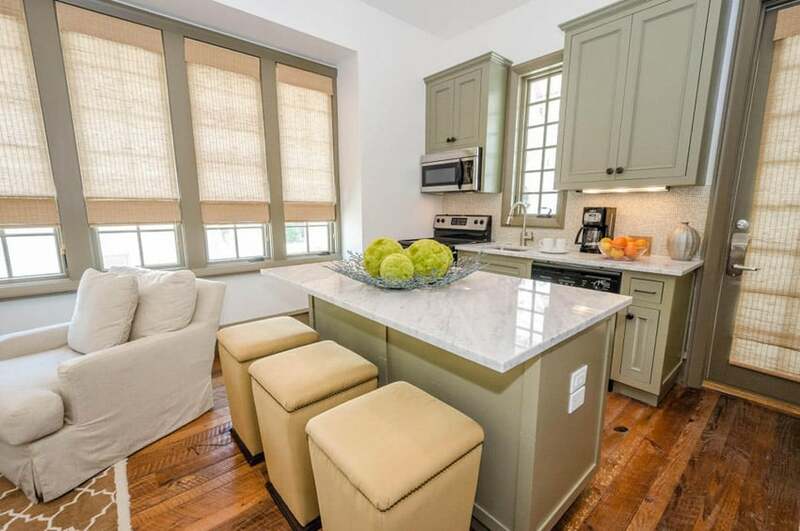 The white painted bar stools have an antiqued finish as well to match the overall look. This modern kitchen adds a touch of Asian Contemporary aesthetic in its design by using hard contrasts of whites and dark wood finishes. Walls were painted in a light oatmeal color which helps bring out the wood tones of the solid Mahogany kitchen cabinets. 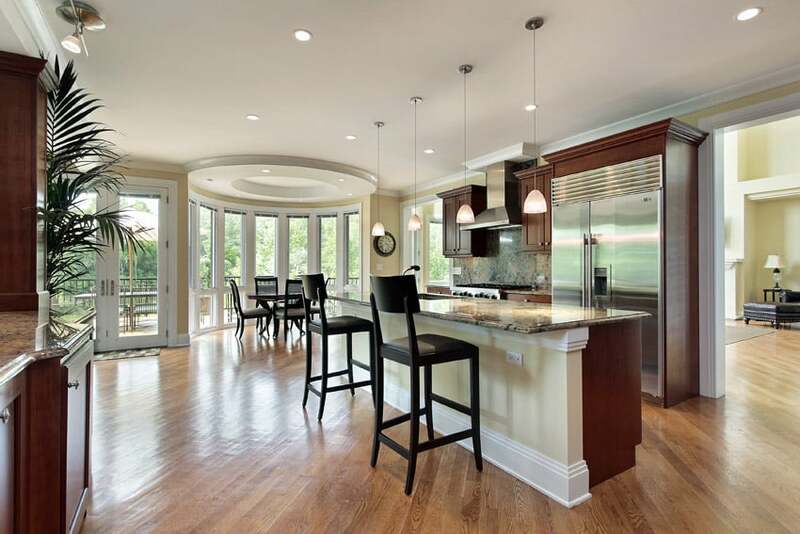 At the center of the kitchen is a unique elliptical shaped contrasting kitchen island with built-up base painted in the same oatmeal color as the walls and topped with white granite. This kitchen island also accommodates 3 barstools with wengue stained legs and white leather upholstery. Soft yellow tones from the color of the walls give a subtle pop of color to this full-sized kitchen. The walls complement the red oak wood floors of the kitchen nicely, as well as the roman blinds with yellow print patterns used on the windows. For the kitchen cabinets, more subtle colors were used – white for the main kitchen cabinets combined with light cream granite counter top, and for the kitchen island, the based was painted in an oatmeal color, topped with the same granite stone and has a pair of bar stools upholstered in beige velvet fabric. A double line modern kitchen space which maximizes the full height of the wall available for storage. 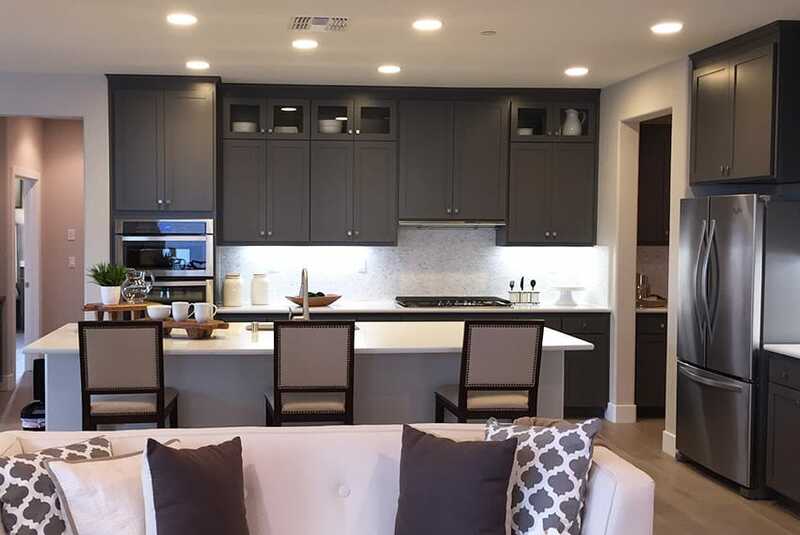 The contemporary paneled kitchen cabinets are painted in a gunmetal color with simple stainless steel pulls, paired with white solid sirface counter top and white & gray mosaic back splash tiles. It has a rectangular island in the middle with light gray painted base and topped with the same white solid surface material as the main cabinets. 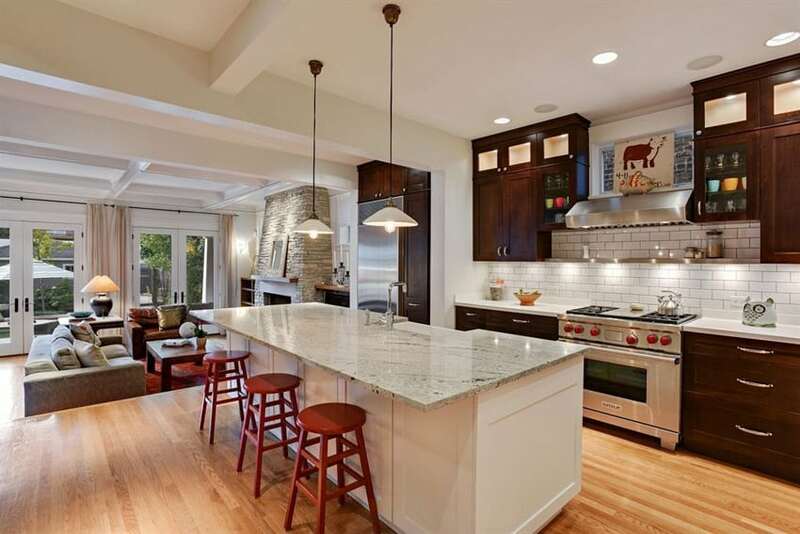 This kitchen island has an undermount sink, as well as space to accommodate 3 bar stools. A modern home with an open floor plan places this small kitchen on a raised area from the main floor. Due to the open floor plan and plain white walls, the space appears to be bigger, allowing you to experiment with darker colors and various textures without weighing down the space. The main kitchen cabinets are in solid mahogany, topped with River White granite solid surface and matched with white subway tiles for the backsplash. It has a large rectangular kitchen island white white-painted base cabinets, built-in ceramic sink and solid white travertine counter top. Kitchen designs with islands that have an open layout can be great for large families and those who like to entertain. 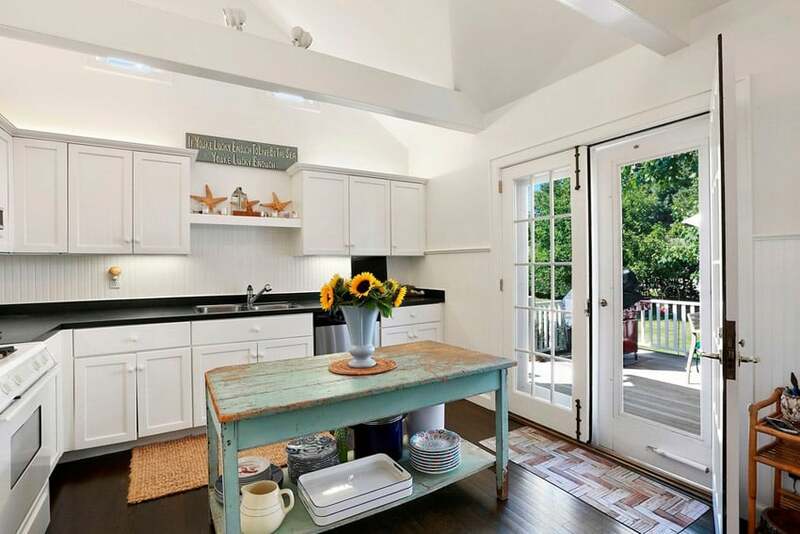 This traditional kitchen with massive doors and windows, looks bright, spacious and inviting. The floors are engineered wood in a light oak color which goes well with the red mahogany solid wood cabinet doors of the kitchen. This is paired with brown granite used on both the counter top and the full backsplash wall. 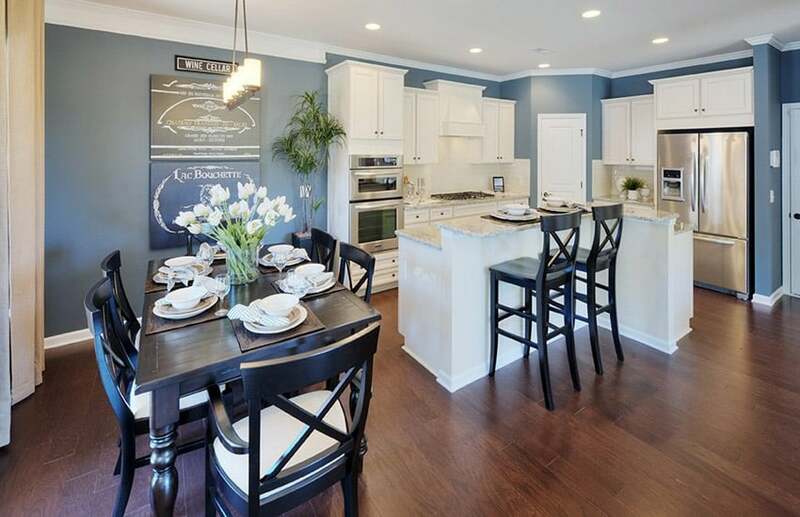 The simple kitchen set up is perfect for entertaining guests, and a nice venue for dining as well. This kitchen has a mix of Italian and French style elements with dark beige walls paired with clean white-painted kitchen cabinets. It has a large rectangular island used for additional prep area, but instead of using white base to match with the main kitchen cabinets, it uses wengue stain finish and tops with with beige granite. 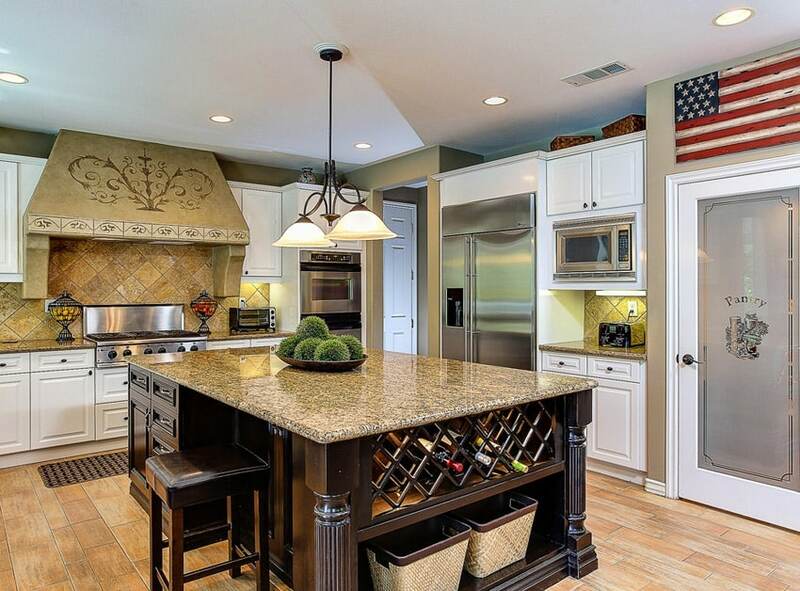 The kitchen island also has integrated storage, wine rack, as well as dining counter space. This is another grand-looking traditional style kitchen which uses a combination of solid walnut finish kitchen cabinets with beige-painted cabinets. 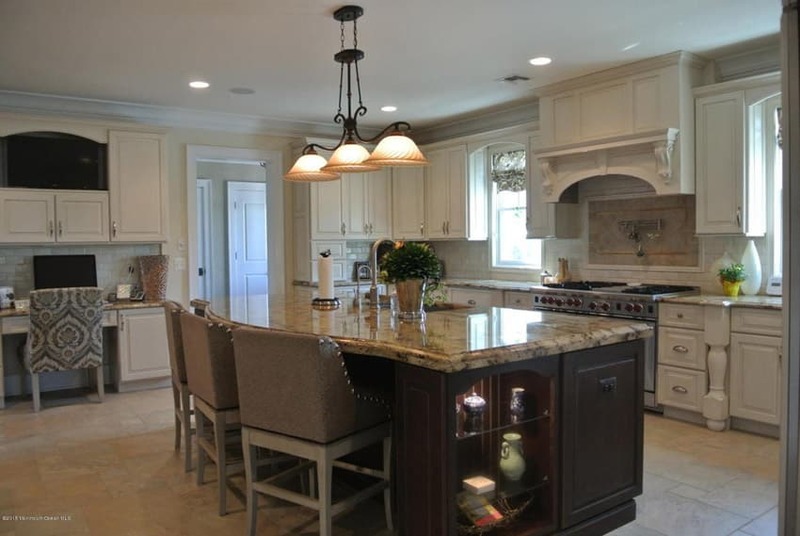 The beige painted parts of the kitchen are all situated at the center, putting emphasis on the cooking area, as well as the kitchen island attached to the two columns. This kitchen island with beige painted base also functions as a bar counter, creating a perfect kitchen for entertaining guests. 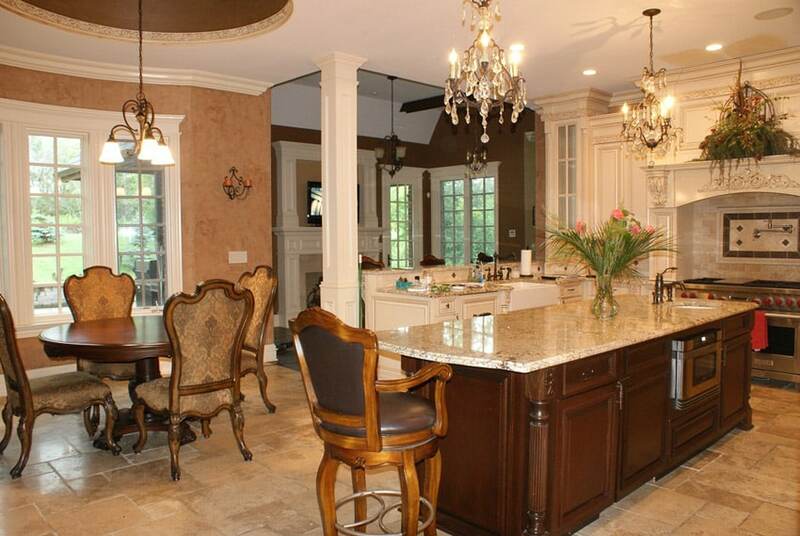 This kitchen has a very elegant classical style. The kitchen cabinets are traditional paneled cabinets with detailed carving details topped with beige granite counter top. 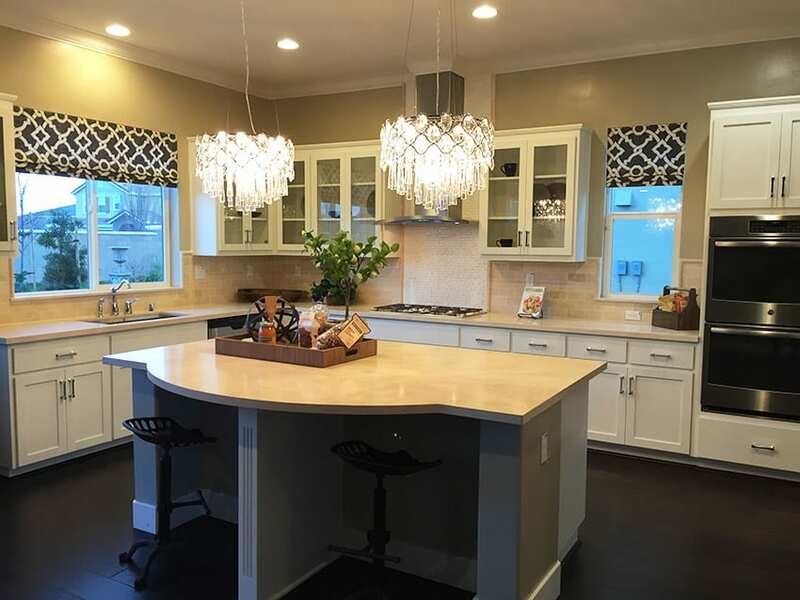 At the center of the kitchen is a rectangular kitchen island with Mahogany stained base and the same granite counter top, with two small pendant crystal chandeliers hanging right above it, completing that elegant appeal. The natural beauty of solid wood is emphasized in this simple country style kitchen. The oatmeal walls and wooden floors already sets a warm background to this kitchen, but its use of natural oak finish kitchen cabinets adds to the natural warmth of the space, its texture giving a natural rustic feel to it. The main kitchen counters uses granite for the counter top, but for the kitchen island with solid wood turned legs, the countertop is wooden butcher’s block as well. This white kitchen has a simple yet elegant appeal to it. The main kitchen cabinets are basic white painted cabinets topped with beige granite and uses white subway tiles. 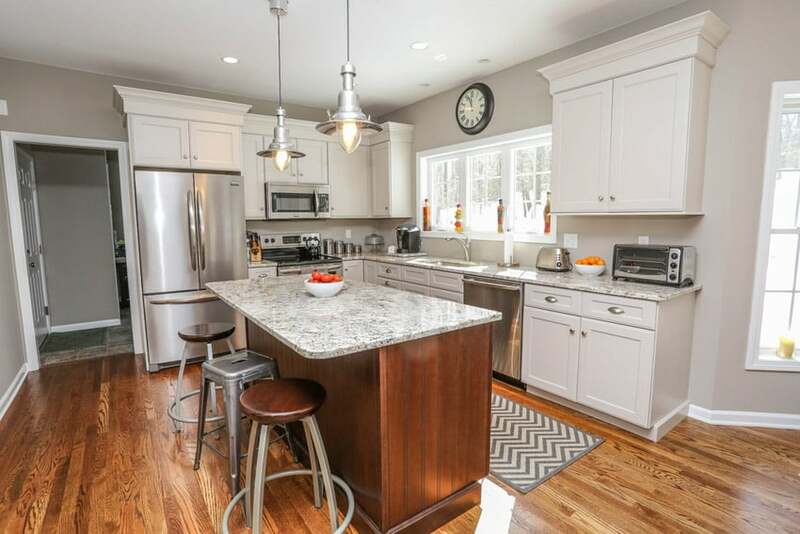 The large kitchen island however, has solid cherry wood base and beige granite counter, with built in sink and space for 3 upholstered bar stools. The dark wood of the kitchen island contrasts nicely with the white kitchen cabinets, and makes it the main focus of the kitchen. This kitchen looks bright and spacious thanks to its light choice of colors for its floors and walls. This allowed the use of bold solid cherry wood kitchen cabinets on both the main kitchen cabinets and the rectangular kitchen island. To help tone down the orange of the solid wood cabinets, white solid surface paired with bone-colored ceramic tiles for the backsplash were used. The same material was used on the small kitchen island. The overhanging island countertop allows for stools to be pulled up to allow for eat-in dining. 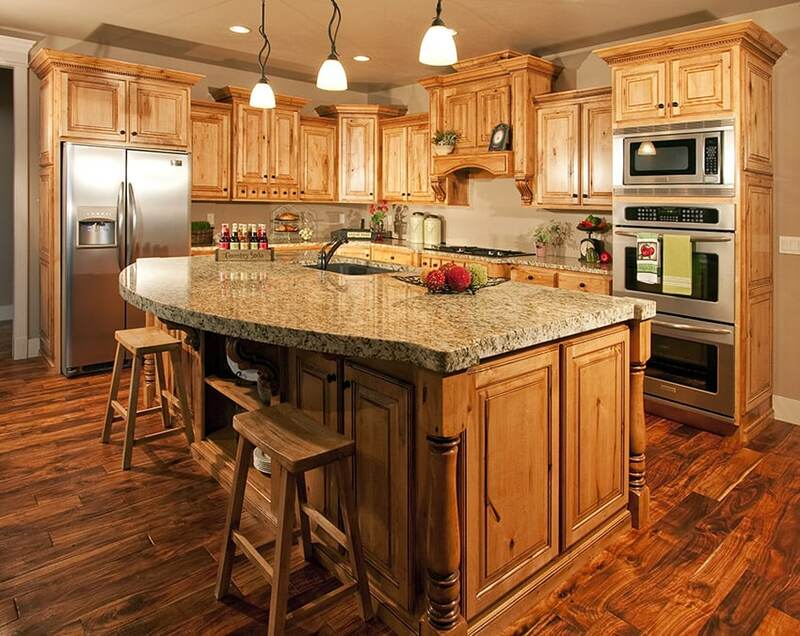 A large traditional kitchen which uses gorgeous solid wood paneled cabinet doors in cherry wood. 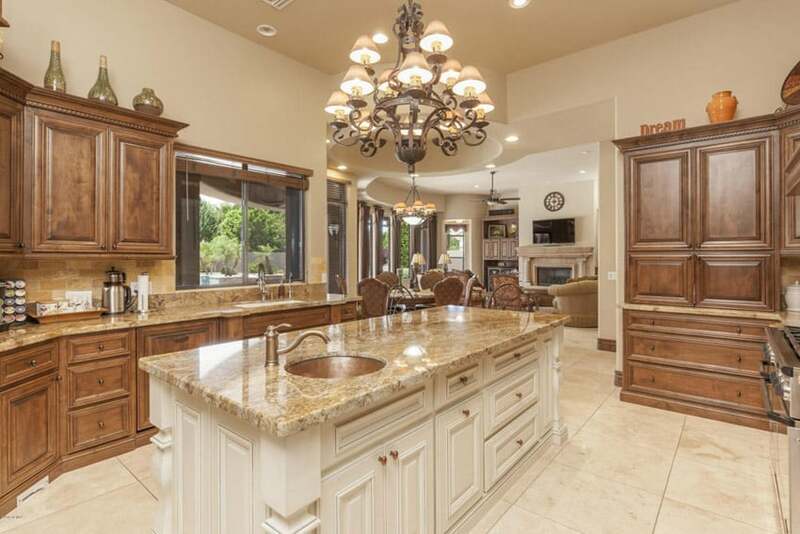 This is topped with light cream color Bordeaux Dream granite counters and even has a rectangular kitchen island in the middle with its edges cut off into angles. This provides additional storage, additional sink area as well as preparation area making the flow of the kitchen smooth and efficient. This modern kitchen design has a dark industrial feel to it but has a cleaner & more elegant appeal to it. The kitchen cabinets are laminated in dark walnut, giving an elegant yet rustic look to the cabinets and uses stainless steel counter and backsplash. The combination works surprisingly well together. For the large kitchen island, is uses the same laminates for the base cabinets, but the counter top is solid cherry wood, giving a nice contrast with the cold feel of the stainless steel counters.